The most common problem about fringes is that it makes your forehead oily all the time. Well, try applying a little bit of baby powder. Not only this, but also most women feel like they have to keep an eyeliner all the time as fringes make their eyes look smaller. Well, the right choice of fringe style could easily solve this problem too! Moreover, if going for fringes, you also have to keep an eye on your face shape and complexion. Not every hair color suits every complexion! So be aware! But, no need to take it on your nerves anymore! I have some beautiful Fringe Hairstyles that would not only suit your hair texture, but also keep you in vogue. Fringes of every kind seem the same, but in reality, they come in various styles. “I like my hair long, and I love my bangs. I love them because I can pin them back or keep the fringe with fringe.” –Cassie Steele. Get ready to get some new ideas for some great new Fringe Hairstyles. Just a proper haircut and a bit of knowledge about hairstyling are all you need to turn your look from dab to fab! Fringe Hairstyles like these look nice both in diagonal as well as horizontal bangs. In this hairstyle, the front bangs are slanted slightly towards one side. Moreover, if you have a square face, then long side bangs would be the best look for you. Just like the gorgeous Bella Heathcote, who keeps putting on different Fringe Hairstyles. Not all bangs look good on all face shapes. Same is the case with long hair. Moreover, Side Fringe Hairstyles for Long Hair is the well-acknowledged in all Fringe Hairstyles. Middle Parted Fringe: This hairstyle goes by middle-parting the fringes on both sides. Equally leaving the bangs on either side, take a hair strand from behind the ear and pin it up. Follow suit on the other side. Leave the locks open at the back to cascade down your shoulder with subtle waves at the ends. Layered Cut with Top-Knot and Fringes: Looking for a hairstyle to keep you cool in summers? 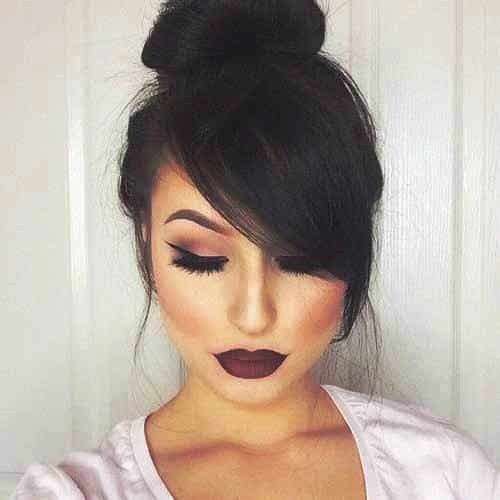 This top-knot would be greatly beneficial then! This will save you from all the extra sweat and wet hair in summers. Also, for further enhancing side sweep your long bangs. Moreover, this top-knot can also go for a romantic date night. Bouffant with Side Fringes: Bouffant is known to change the whole look of your face. They give your hair an uplifted look, affecting your face shape too. Let the fringes sweep sideways in a funky look. Leaving the bangs, start brushing the hair in a bouffant leaving the rest of your long locks on both sides of your shoulder. If you want to go for Fringe Hairstyles, then you better choose wisely. Just like the beautiful Bella Thorne. If you want some short fringes, then make sure to go with horizontal fringes. It tends to make the fringes look shorter and smoother as well. This hairstyle would work nicely with long hair. Especially, when you give heavy curls to your long locks. This hairstyle might give you an “old vintage” vibes. It makes you give an older and confident look. It goes with a large bouffant. The fringes are slightly side swept in the front, leaving some long tresses on the sides. These also help to beautifully frame the face. Try giving it a copper red color like Christina Hendricks. Nothing in this world could come in comparison with curls. Curls are the traditional style for many women. 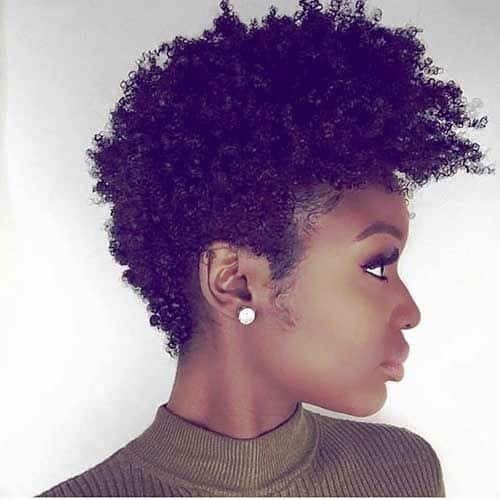 Especially, natural curls have their own elegance. When going for curly fringes, make sure to curl all the hair similarly. This also enhances the volume and look of the hairstyle. Curly fringes like those of Zendaya Coleman look amazing. Moreover, you can also try a neutral brown hair color for this hairstyle. Looking for some zero maintenance and extremely gorgeous hairstyles? Then go for this statement-making Fringe Hairstyles for Short Hair. Either it is short bob with micro fringes or layers with long bangs, short hairstyles come in luxurious varieties. Forehead-Veiling Fringes: This hairstyle with side angled fringes is worn by Felicity Jones. It is best if the fringes are cropped in diagonal. It also helps with slimming round faces. Keep a dark hue and set beautifully with a hair serum. Swoopy Long Fringes: Long swooping fringes are the best choice for women with a wide forehead. Furthermore, a heart-shaped face and a pointed chin also get along great with this hairstyle. Also, add an extra amount of volume by a bouffant to get a breath-taking look! Timeless Bob with Fringes: Time flies like an arrow, but in today’s modern world, no one has time to spend hours in front of the mirror. So for all those busy people out there, there is good news for you! 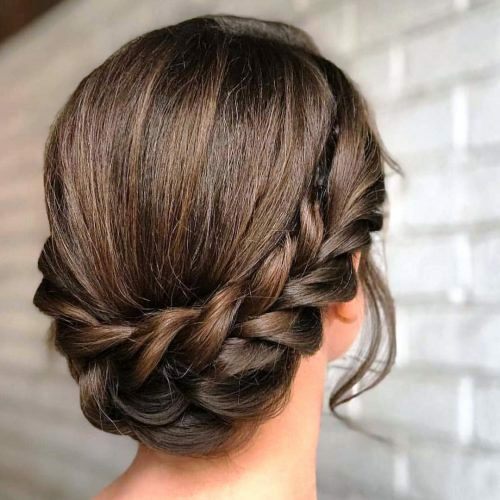 This hairstyle is not only pretty and classic but also zero percent time taking! Bobs look best with pointed chins. Moreover, a simple headband can make you as comfortable for Gym as much as a small ponytail for jogging. Hence, bobs can easily be molded into different styles effortlessly! 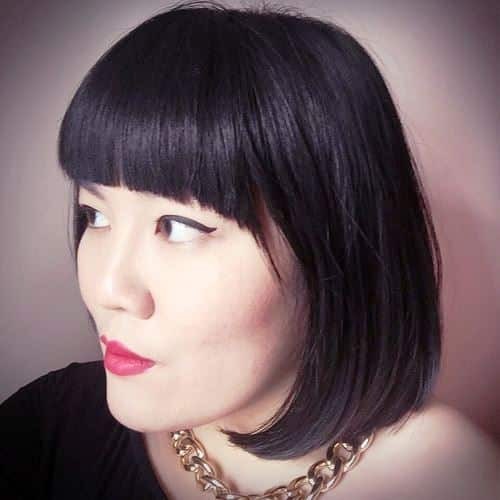 These kinds of Fringe Hairstyles work best with women with a thinner face. 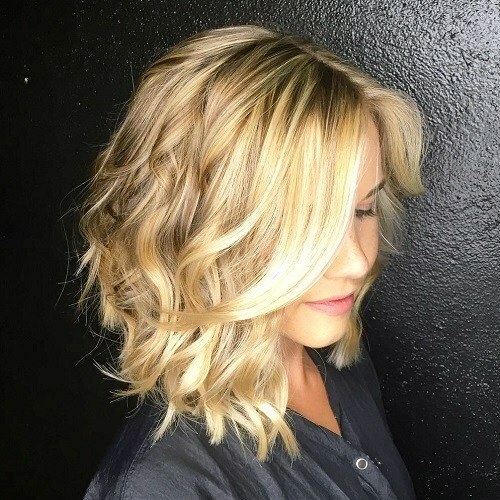 Crop your natural wavy hair above the shoulder length. Pull the fringes on one side and keep hair on that side slightly longer than the other. Waves make this hairstyle perfect for a beach day. Moreover, golden honey brown waves would add up to the beauty of this messy look. Don’t let your age make you fall out of style! This hairstyle is a vintage look mostly preferred by aged women and also suits youngsters equally. 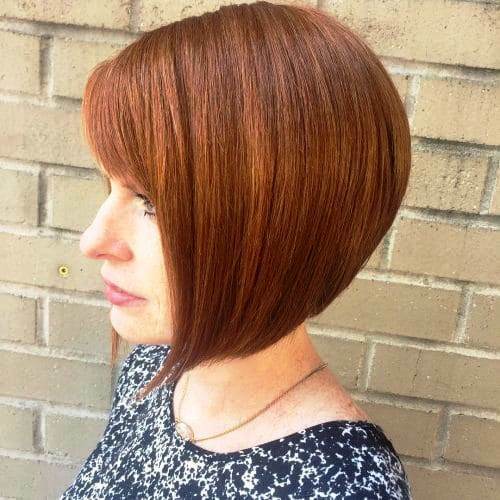 This hairstyle is a soft bob cut, which is inverted inwards at the ends. Sweep the feathered bangs to one side. This hairstyle is as old as the 1960’s when Jane Fonda firstly started her career. Some of the women are really impressed by Fringe Hairstyles but are afraid to go short. The perfect remedy for such a problem is to opt for faux fringes. Faux fringes come in various types and styles. 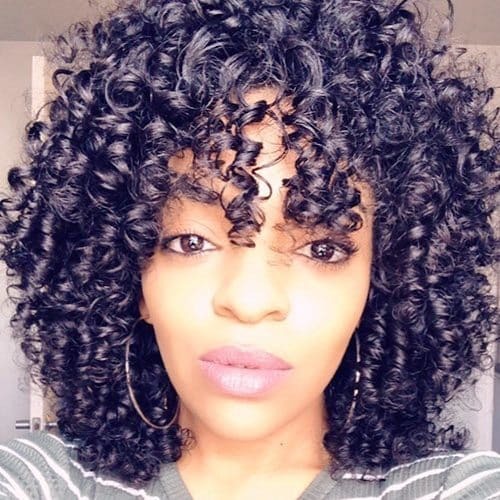 Curled fringes are an awesome choice and are adopted mostly by black women. You can either try a wavy faux fringe or a sleek looped faux like Rooney Mara. The style you wish to hold the leftover hair is optional. But mostly, faux fringes work best with hair held in a bun or a sassy updo. Fringe Hairstyles with braids look extremely amazing. Braids anyway have their own charm. Start with brushing all your hair on one side. Then tie a low braid just above the nape of your neck. Make sure to take out some layers on the sides for the fringes. In this way, this hairstyle carries “two looks in one style!” Also, go with a vanilla blond hue with dark roots. 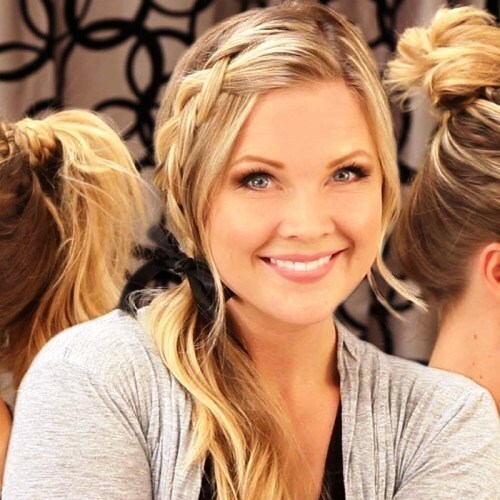 This is a dream hairstyle for those women who are looking forward to a romantic date night. This elegant look is designed by cropping smooth fringes with sides slightly longer than the forehead fringes. Tie rest of the hair in a neat bun or any other kind of an updo. It is optional. These smooth and blown-out fringes would definitely give an outstanding look to your beauty. This hairstyle is an extremely messy yet gorgeous one. Let the fringes fall to the front and then sweep them at one side. On the same side, pull up a messy braid. Furthermore, if your hair is cropped in layers, then the messy look would come naturally. 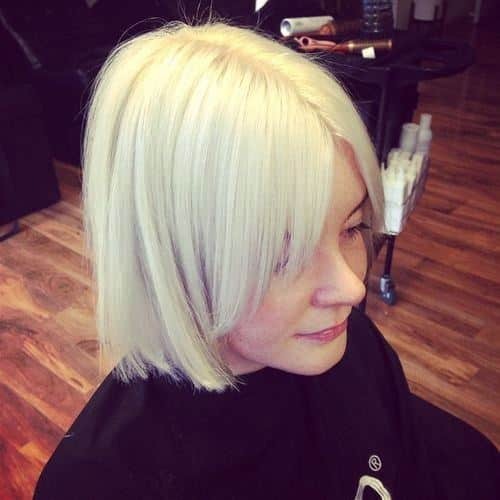 Try going with an icy blond hue for this hairstyle. Fringe Hairstyles for evenings require a classy look in which your hair is best when kept away from your face. It is not only easy to carry but is equally gorgeous. Just like the beautiful Jessica Chastain. She carried her wavy locks in a side down posture which looks amazing. Choosing side-fringes is always the best way to achieve cuteness. If you want to choose a nice color of your own, then go for cherry brown hue. This hairstyle suits perfectly with blunt bangs. It gives a nice dramatic look for a formal occasion. 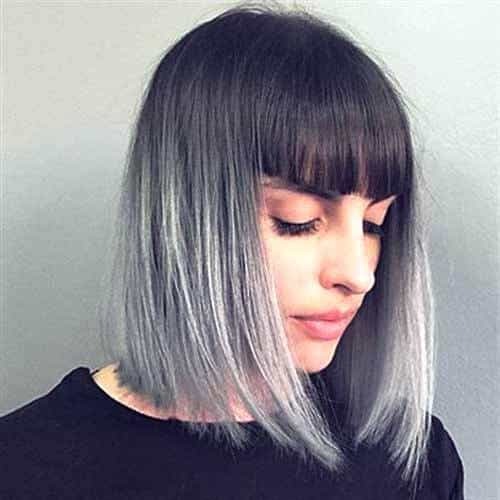 I would suggest you go for this look, just if you like visiting your stylist often because this style needs occasional trimmings and a lot of maintenance. This hairstyle with blunt fringes is seen on the pretty youngster Emma Roberts, who successfully carried this look showing people that just a single hairstyle is enough to prove a big amount of confidence! There are many Types of Fringes, one of which is the micro fringe. It looks best on women with wide foreheads and it is cropped at half the length of your original fringes. Moreover, long fringes mostly suit women with long or an oval face shape, but micro fringes are beneficial for round big faces. The box bob looks good on straight hair as it collaborates with the neatly trimmed micro fringes. Fringe Hairstyles of middle length could be transformed into any look easily. 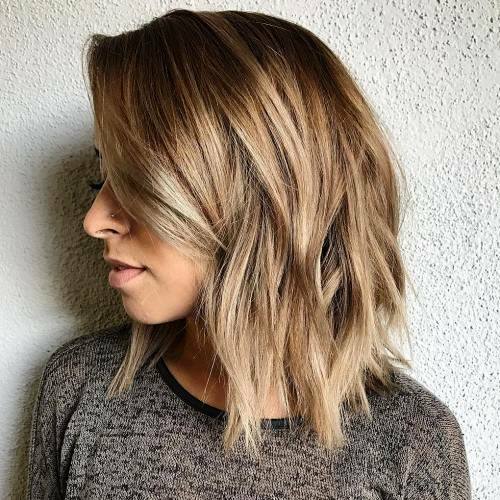 For this trendy look, crop your hair below shoulder length. This works finely with naturally wavy hair or you can also add waves artificially. Next, you would go for a Long Side Fringe. This wavy hairstyle is sure to give you an original messy look. Also, add a frosted blond color at the ends of your hair for a more attractive look! This hairstyle is a lifesaver for women with thin hair. 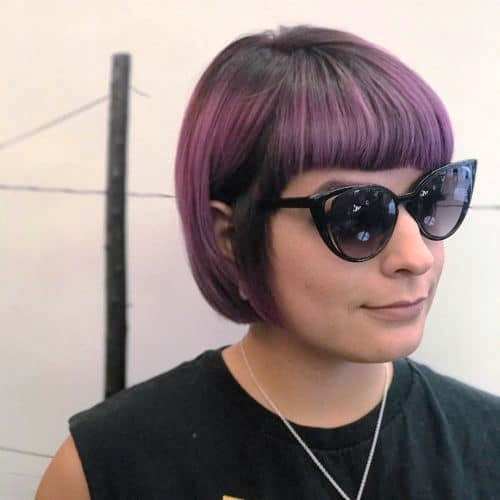 If you have thin hair and you are worried about your fringes, then ask your stylist to start from a little higher from usual for thick fringes. Moreover, keep tresses of hair slightly longer on either side for a wispy look overall. 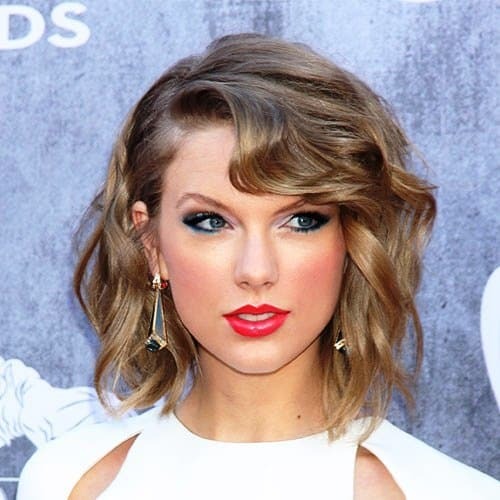 Try catching a glance at Taylor Swift’s choices of Fringe Hairstyles. If you are afraid to commit yourself for all-time short bangs, then you might love to go for this hairstyle. A simple asymmetrical cut with the long fringes sweeping on one side is all it takes for this look! Furthermore, opt for a mahogany brown hair color. This hairstyle is the best choice for those who always look up for something fast. Once you have got your hair in a feathered fringe cut, you do not need to worry about time taking hairstyles then! Whether it be in a ponytail for work or a bun for a party, just pull it up, leave the bangs swaying and slay the day! As the name suggests, this hairstyle is beautified with china doll fringes and a layered crop. If you have thick hair, then you must definitely opt for this hairstyle. Moreover, it may suit on any face shape. Also, try an ashy blonde hue for this look. So here I out-listed some fascinating trendy Fringe Hairstyles, which I’m sure would have helped you to make your mind for a blowing change! Fringes are known to change not only the outlooks greatly, but also the confidence it builds in your persona. So, if you ever feel like its time for a change, make sure to try Fringe Hairstyles. Because sometimes my dear, a change of hairstyle is all it takes! “If I want to knock a story off the front page, I just change my hairstyle.” –Hillary Rodham Clinton.